Lloyd Marcus -- But, What About Justice For Zimmerman? BUT, WHAT ABOUT JUSTICE FOR ZIMMERMAN? I keep thinking of an episode of the 1973 TV show, “Kojak: The Marcus-Nelson Murders.” Homicide detective Kojak suspects that the black teenager accused of murdering two white girls is being framed by his fellow detectives. The case gets a lot of media attention; politics and careers enter the mix. The frightened accused black kid pleads his innocence to detective Kojak who believes him. Kojak educates the defendant to the cold harsh reality of the situation. Kojak informed the kid that despite his innocence, the case had become such a political hot button and because the police held the kid in jail for so long, he must be found guilty of something. Most Americans desire a fair and just outcome of this tragedy. But, Lord help us if the evidence proves Zimmerman to be innocent. If Zimmerman is ruled not-guilty and allowed to walk, I foresee Rodney King-type riots in the streets. Thus, is Zimmerman's fate already sealed? Will a jury decide Zimmerman must be declared guilty of something? 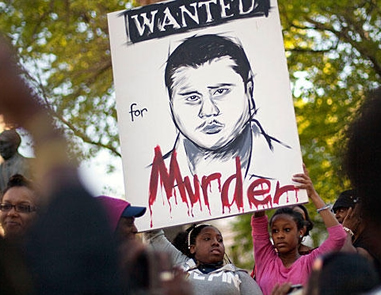 While Al Sharpton, New Black Panthers and all of the other racist race-hustling usual suspects clamor for justice for Trayvon Martin, I wonder if justice is even possible for George Zimmerman. Will political correctness ensure that Zimmerman be found guilty of something regardless of the evidence? For example. Clearly, the individual mandate in Obamacare is unconstitutional. And yet, Obama believes he can bully the Supreme Court to rule in his favor because “he” believes the mandate is a good thing. Ponder that folks, the president is pressuring U.S. Supreme Court justices to bend the truth and the law to suit his desires. Obama, the president who would be King. For years, Democrats have been trying to abort the thorn-in-the-side stumbling block to their socialistic agenda known as the U.S. Constitution. Who could have imagined deceiving the American people into putting a black Trojan Horse extreme left liberal into the Oval Office would “Git-r-done”? If Obama successfully forces U.S. Supreme Court justices to succumb to his politically correct interpretation of the law and rule Obamacare constitutional, setting such a precedence could mean so-called “white Hispanic” George Zimmerman is toast. It would mean facts, truth and the law are no longer relevant – only what the people/mob want rules the day. Regardless if the evidence proves otherwise, Zimmerman will be found guilty of “something” to avoid riots in the streets. We are talking political correctness on steroids. Folks, I am not saying Zimmerman is innocent. I do not know. I am simply saying in these morally bankrupt times in which we live, I am concerned that facts and truth are becoming irrelevant. Have you heard the slightest hint of media outrage over the threats on Zimmerman's life? Have you heard any rebuke or threat of the Obama administration taking action against these thugs? Oh I know, they are still busy investigating Ted Nugent for passionately encouraging voters to “vote” Obama out in November. But seriously folks, the media and Obama administration’s passivity regarding the threats on Zimmerman's life is shocking and should be an eye opener to us all. Anyone on the left's excrement list can expect no justice and no peace. Where was the national media investigation, outrage and clamors for Holder's immediate resignation? Are we living in an Obama administration parallel universe bizarre-o world? Do I really need to state the obvious re-action had there been accusations of Bush's Justice Department saying they would not pursue white defendants? No presidential call for civility toward George Zimmerman. Zimmerman is for the most part, on his own. All Zimmerman can do is hide. My fellow Americans, this is so very, very wrong. What is becoming of our great country? Lord help us!